Late last October I found myself wandering around a local craft fair in my home town. The scent as I walked in was amazing. After a leisurely meander, stopping by the Pampered Chef stall, a cupcake counter and some fabulous cross stitching I found out where the scrumptious smells were coming from. I adore scented candles. But I find most of them disappointing. Never quite living up to the promise of their label or their initial sniff test. I am a huge fan of sweet caramel tones at the moment. Probably a comfort thing as both my mum and gran were bakers, at home and at work. 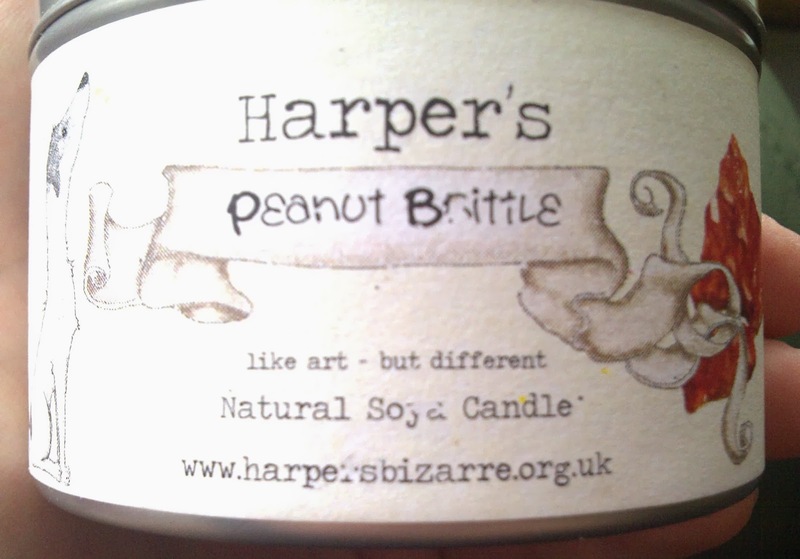 Made with natural soya wax Victoria, the lovely lady behind Harper's Bizarre, mixes each batch [of candles by hand. If you visit her stall you can also find limited editions that don't make it onto the website. 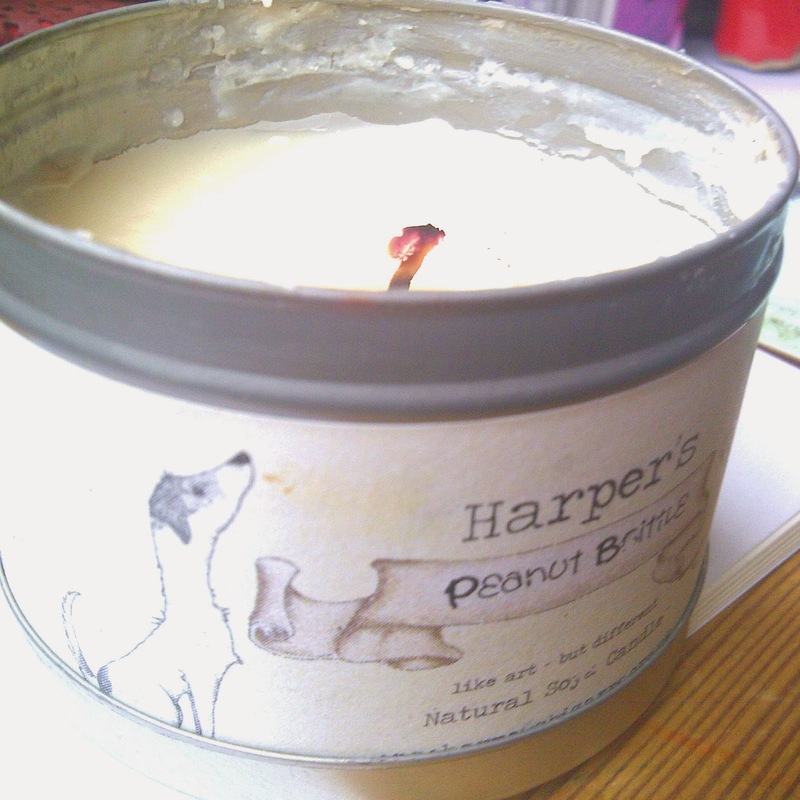 I'm currently burning Peanut Brittle, and have been since October - giving it a miss in December for a more cinnamon-based candle, which is an incredibly cozy candle. I am lusting after so many others. On my long list are Cherries Jubilee, Birthday Cake, Fruit Fairy, Spicy & Homey, Sweet & Musky, Sweet Pea and Cherry Pie. Those would last me a very long time indeed, and new ranges are brought out regularly. Recent additions have been Licorice Alsorts and Parma Violets. If you are in the East Riding of Yorkshire you can find these vegan beauties at the UpMarket popup shop at Hull's Prospect Centre every Saturday 9-5pm and on the 1st Sunday of the month at Humber Bridge Farmers Market 9-1pm. At £8 per candle, or 3 for £20, each candle has an approximate burn time of 25 hours. Victoria has a fantastic nose and has even perfected a candle which smells like an authentic Jaffa Cake, which even now I still covet. This is a great product which stays true to it's scent and lasts for ages, with a nice even burn and makes a wonderful gift for that someone special.